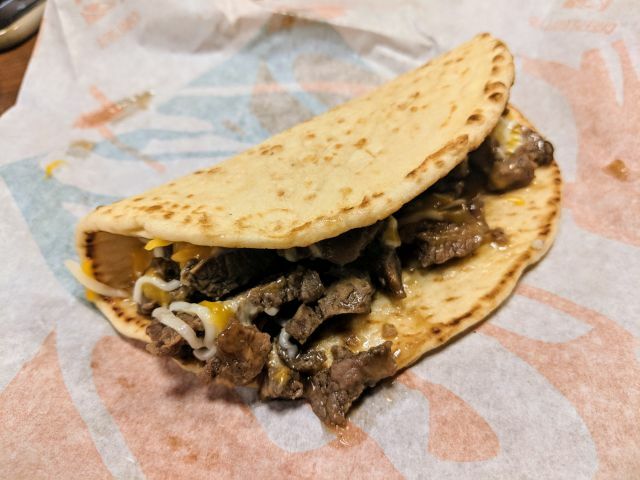 Calling it their take on "steak and fries," Taco Bell tests the $7 Double Steak Melt Deluxe Box in Cleveland, OH. For the price, the combo meal includes the new Double Steak Melt (a Gordita flatbread filled with grilled, marinated steak and melted 3-cheese blend), an order of Nacho Fries, a crunchy taco, and a medium drink. The Double Steak Melt can also be ordered by itself for $3.29. I was able to try it and it's basically like a smaller version of the discontinued Triple Steak Stack (which includes a triple portion of steak compared to the double portion for the Double Steak Melt). It was fairly meaty and decently cheesy with a nice flavor for the meat-and-cheese crowd. The Double Steak Melt was also tested last February as the "Double Steak Gordita Melt." 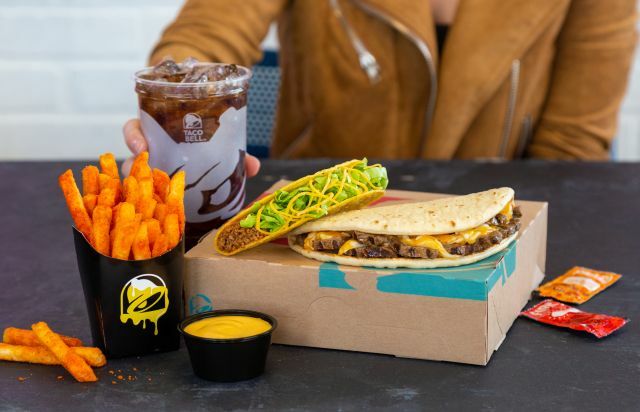 It was offered as part of a test of the "Three Course Meal," which included the Melt, chips and nacho cheese, two Cinnabon Delights, and a fountain drink. The Deluxe Box represents a departure from the $5 price point standard of Taco Bell's Box combos. It also falls onto the high end of Taco Bell combos in general as only the #11 combo (three Doritos Locos Supreme Tacos and a drink) costs more at a suggested price of $7.19. That being said, none of Taco Bell's regular menu combos include steak (although you can sub it in for an extra fee) and only a few $5 Boxes in the past have included a steak item. Crunching the numbers, the items in the Double Steak Melt Deluxe Box would cost about $7.66 if purchased separately, which is not all that great from a value standpoint. First photo via Taco Bell. Second photo by BrandEating.com.